Let us start with what metal fabrication is all about. It is basically considered the building process of metal structures through cutting, molding and assembling techniques. Unlike older days when metal fabrication entailed manual processes, these days high-end technologies are involved in fabrication of metal structures. Cutting: Experienced metal sheet fabricators basically conduct these tasks: sawing, shearing and chiseling. They do these through electronic or manual processes. Cutting also involves torching which takes place through hand-held devices like the plasma torch or the oxy-fuel torches or plasma torches. Numerical control cutters are also used in cutting. Bending: The process of bending is possible with manual or electronic power brakes. This can also be done with press brakes and various other tools. Today’s experienced metal sheet fabricators make use of the press brake to bend a sheet into a particular form. With the help of CNC controlled back gauge cut parts are positioned properly. The bend lines are then re-aligned. These days press brakes work seamlessly with the help of software programming that allows faster and improved performance. Assembling: The assembling part is the most important of all. Experienced metal sheet fabricators give in their best efforts to ensure that all parts fit seamlessly. However such integration needs high-end technical support. 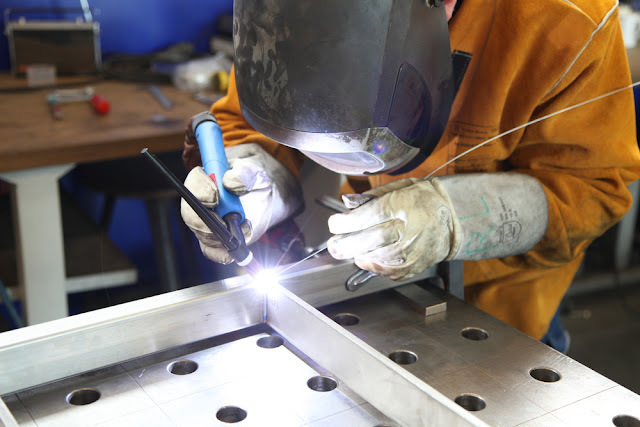 Thus, experienced metal steel fabricators incorporate their skills and knowledge to weld the metal pieces and then bind them with strong adhesives followed by riveting and fastening. Sometimes bending is also required during this stage of metal fabrication. Sheet metal and structural steel are the common starting materials for metal fabrication. Other commonly used materials include flux, welding wire and fasteners. These help the sheets to join. During such manufacturing process both types of labor is necessary like manual and automation. A majority of shops which specialize in such kind of metal work are commonly known as fabrication shops. Ironworkers: People who are involved in this type of metal works are known as iron workers. They are also called steel erectors who engage their labor in fabrication. Often their efforts are channelized in prefabricated segments. Boilermakers: laborers engaged specialize in boilers. Their offerings are not only restricted to fabricating boilers but others as well. Millwrights: The millwrights specialize in bringing up the saw mills and grain mills but have their efforts to offer in other fabrication work as well. Blacksmith: The laborers are also involved in fabrication of other metal works. Metal fabrication involves the creation of structures and machines from a wide range of raw materials. A fab shop undertakes a job after examining the engineering works involved. If the workers are being able to carry out the work with efficiency they are being awarded a contract. When it comes to metal fabrication the raw materials need to be cut to perfect size through shearing. In most of the vases band saws are designed for cutting the metal. They have hardened blades along with feed mechanism for smooth cutting. There are also abrasive saws referred to as chop saws for abrasive steel cutting. Forming is another important aspect of metal fabrication. It basically refers to material deformation and is mostly applicable to metals. In case of forming, tremendous pressure is applied to a metal for it to take form of a raw material. Visit us for more info about metal fabrication.